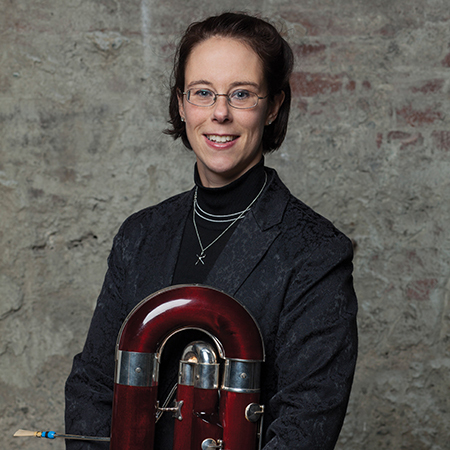 Born in Sorel-Tracy, Sophie Dansereau* obtained the \”Prix avec Grande Distinction à l’unanimité\” in bassoon and chamber music from the Conservatoire de Musique du Québec as well as a Masters of Music from Yale University. Her main teachers are Richard Gagnon, Frank Morelli, Christopher Millard and Stéphane Lévesque. Contrabassoonist and assistant principal bassoonist of the Vancouver Symphony and principal bassoonist of the CBC Radio Orchestra, Sophie has performed with the Auckland Philharmonic (New Zealand), the New World Symphony, the National Art Centre and l’Orchestre Symphonique de Québec, as well as several major music festivals around the world. She has worked on several occasions with the finest conductors, such as Bramwell Tovey, Seiji Ozawa, Robert Spano, Michael Tilson Thomas, Pinchas Zukerman, Alain Trudel, Yannick Nézet-Séguin, and Charles Dutoit. Sophie has been awarded many prizes in major national and international competitions and was featured as a soloist on many occasions with the APO and the VSO. A sought after bassoonist in chamber music, she is a member of the Admare Quintet. Sophie, who had received the Governor General Medal for Academic Merit in 1992, has also served on the faculty of the University of British Colombia. She is now teaching at the Vancouver Academy of Music and is the instructor for the woodwind section. Besides her full work schedule, Sophie is an enthusiastic runner and swimmer. Her unexpected time at the 2007 Vancouver Marathon gave her the qualification for the legendary Boston Marathon, which she plans to train for and run in 2008.